The Blueseed project is a ship that would anchor about 12 miles from Silicon Valley. In international waters, it would allow tech employees to live and work close to the US startup companies that need their help. 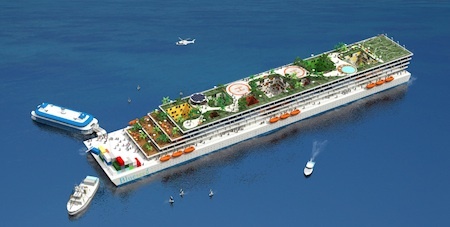 The Blueseed ship is expected to be ready for occupancy by 2014; one of the concept vessels is shown above. Xanadu was the second of the Floating Island chain of independent international corporate entities. Ultimately they would be strung along the world's equator; new islands bringing life to a watery desert. Six of the islands were in place, two as mere skeletons. From the air they looked a little like lily pads, a little like snowflakes five kilometers in diameter. Counting ponds and water recreation areas, the farms and breakwaters, each enclosed an area closer to forty square kilometers. In time, Blueseed ships may become data havens, offshore server farms that maintain data outside of our national datanets, as envisioned in Bruce Sterling's 1988 novel Islands in the Net. Via Tom's Guide and see also the Blueseed website.